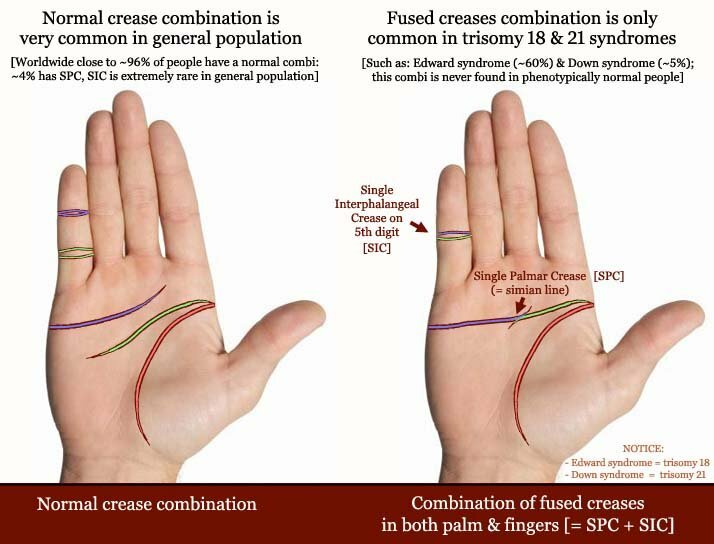 Here is some collected basic information about the Simian line, also known as the 'Single Transverse Palmar Crease'. 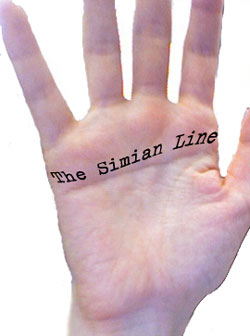 Also known as the single palmar crease or Simian crease, the Simian line is when the heart and head lines intertwine to form one line across the hand. The feelings and emotions (of heartline) are under strong intellectual control (of headline) or vice versa. They may find it hard to distinguish between thoughts and feelings...are they thinking what they're feeling or feeling what they're thinking?....as the two are intertwined and combined. Key word for this line is "intensity". It can bring single mindedness, "tunnel vision", intense concentration or even obsession in some part of their lives, as they have the ability to put their heart and mind into whatever interests them. People with Simian lines can be very successful because of their ability to put all their energy into a project. Some people with Simian lines may be good at doing deep detailed research, interest or activity, in a specialist area ....others may have a more emotionally based simian line that makes them very passionate about their relationship or obsessed with a person, etc. All of these people might have very different personalities but they all share the Simian line intensity. Every aspect of the hand has to be looked at in conjunction with all other hand features. For example, whorl fingerprints add intensity too, so person with simian & whorls would be more mentally intense than simian with loop fingerprints. Many people with Simian lines tell me they always felt a bit different from other people, but didn't know why, until learning about their Simian line helped them to understand themselves. There are also variations on this line: semi-Simian, "simianesque", some people have an extra added twig of heart or headline as well as the main line. 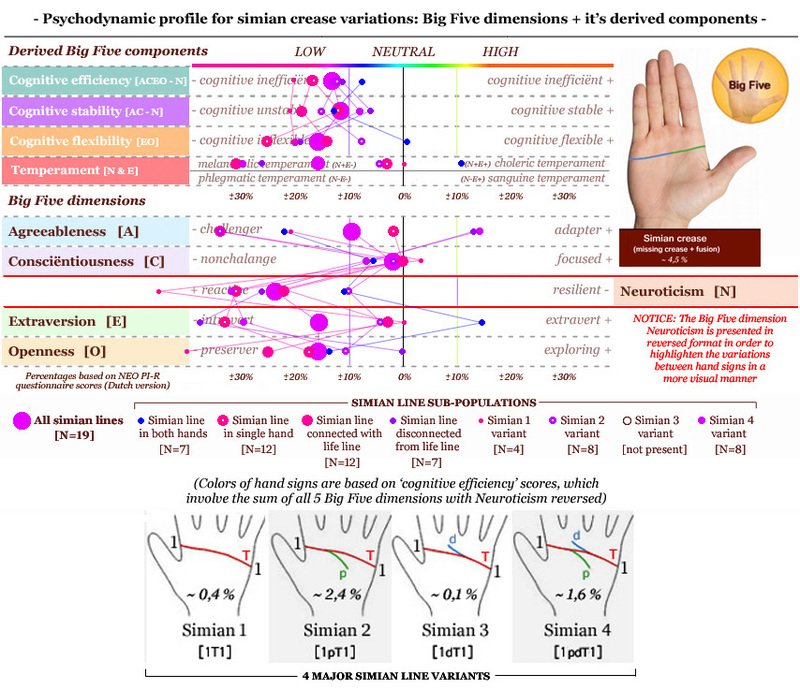 The Simian Line is one of the most scientifically researched features of the hand. It is found on about 2 - 6 % of the general population (depending which study you read, maybe more depending on ethnicity) but is much more common on people with Downs Syndrome and also on people with certain other chromosome disorders. This fact causes a lot of misunderstanding. It does NOT mean that people with simian lines have a greater likelihood of having a chromosome disorder, but that people with certain chromosome disorders are more likely to have a simian line. 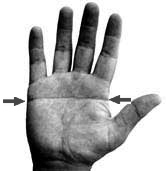 Most people have two major transverse lines in the upper half of the palm. In Palmistry and Hand Analysis these are called the Heart Line and the Head Line. When the Heart Line and Head Line are fused together, only one major line is present, and it extends all the way across the hand from edge to edge. This is called a "Simian Line", or "Simian Crease". Medical references call it the "proximal transverse palmar crease" or "single palmar crease". 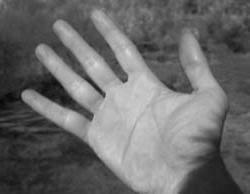 Palm readers and Hand Analysts have observed over the years some common traits in people with Simian Lines on one or both hands. [This pertains to those people who have no apparent medical problems.] People with Simian Lines generally live their life differently than most other people who do not have Simian Lines. Not necessarily living better nor worse. Just living more intensely with an undercurrent of uneasiness. It is interesting that a number of well known people with a Simian Line have made a positive contribution to history. They include British Prime Minister Tony Blair (both hands), former Russian President Nikita Kruchev, writers John Steinbeck and Henry Miller, to name some well documented cases. When the Simian Line occurs, the "Great Quadrangle" is entirely missing. There is no distinction between what is desired (the Heart) and what is thought (the Head). The result is an incredible intensity of nature, but a strong tendency to rush into all things without thinking them through. Also note that without the Great Quadrangle, we have a completely closed-minded individual. Because they are so focussed on a particular thought, all else is excluded. In another possible appearance of the Simian Line, the lines of Head, Heart, and Life are all joined. All the above traits apply, but even more intensely, since there is now no distinction between the thoughts, desires, and life itself. The Simian Line gives the ability to focus on one thing, absolutely, to the exclusion of all else. These people generally achieve and accomplish far more than most, developing techniques and inventions that will last for generations. They also experience far more misfortune than most, usually due to the same intensity that drives them. A truly double-edged sword. This is Jennifer Boyer's excellent website with collected info about Simian lines. I just wondered does a simian line appear on any hand shape or does it appear more often on a particular hand shape. Thanks. Tony Blair (former British prime-minister) has a simian line in both hands. Thank you very much for the information on the simian lines. It is extremely accurate. I had a question, though. So is it possible to have a simian line with a fate line cutting across the middle and through a feathered girdle of venus? adding a link to Martijn's "advanced" considerations on Simian line. "On October 5, 2007 our first son Jake was born, 3 weeks and 1 day early, but healthy and strong. He was 7lbs, 4oz, so he was a big boy for being so early. He was born around 2pm, so it was the next day that his pediatrician came in to look at him. Dr Schullman was his name and he came into my hospital room mid-morning to speak with us. Walked in and said "Congratulations!! Jake is beautiful and looks great! There is just one thing" Of course my heart totally dropped and I probably looked like I was going to vomit! Dr Schullman went on to explain that Jake has double simian creases on his hands. 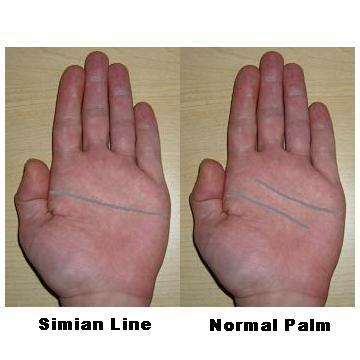 Simian creases are the fusion of the "heart" and "head" lines on the palm of your hand. It is quite rare to have a simian crease and even more rare to have it on both hands. Dr Schullman informed us double simian creases are a characteristic seen in people with Downs Syndrome. He explained that besides Jake's almond-shaped eyes, he presents no other Downs symptoms, so we can just wait and see or we can have a chromosome test done. We decided to get the chromosome test done and 3.5 weeks later we were told that Jake does not have a syndrome and that he is a perfect XY chromosome. He is just a unique boy with a unique and rare physical characteristic!!!" Greetings to Ms. Lynn And Others. Mr. Martijn, I am especially interested in your opinion about any issues that I’ve raised in my post. I happened to read this thread recently. I have for quite some time now been ‘a bit skeptical’ about some of the results attributed to the simian. If anyone cares to answer my question, please read on. I have referred to lines from Ms. Lynn’s post. My question: Many of the qualities attributed to the Simian can be found in people without a Simian. Qualities such as 'single mindedness, intense concentration or even obsession' & almost every other quality listed, are as much a part of the normal populace (albeit perhaps at the extreme ends of the statistical bell curve). Now, from a scientific perspective, how did anyone determine that these attributes are exclusive to & hence directly caused by the Simian ? Are there any scientific tests (like the IQ test for example ) to identify ‘tunnel vision’, inability to separate thought & feeling & other such exclusive qualities apparently caused by the simian ? Is there any statistical empirical data? Please forgive my question if it offends anyone, but I suspect that this is an anecdotal myth that is repeated by everyone without questioning what it really means. I suspect that far too many people parrot these lines on their websites & books without objective evidence. I also suspect that many palm readers have been using subjective criteria to validate what they’ve read about this line. Please note that I am NOT questioning its correlation with the Down’s syndrome or other such maladies. I am questioning results attributed to normal people with Simian. What does this statement made by ‘Kenneth Lagerstrom’ mean ‘…since there is now no distinction between the thoughts, desires, and life itself...? What may I ask does this statement imply? I know 2 people who have these lines joined, they are perfectly normal. I’ve known them for almost a decade. If I were to tell them this, they would give me a blank stare & think I'm crazy. They are great guys, happily married, with kids, normal jobs. Again, I want to emphasize that my intention is not to question or offend anyone. My profound ignorance may be playing a role in my question. If so, please forgive me. This is just an attempt to close large gaps in my own understanding of its applicability. My question: Many of the qualities attributed to the Simian can be found in people without a Simian. Qualities such as 'single mindedness, intense concentration or even obsession' & almost every other quality listed, are as much a part of the normal populace (albeit perhaps at the extreme ends of the statistical bell curve). (1) Now, from a scientific perspective, how did anyone determine that these attributes are exclusive to & hence directly caused by the Simian ? Are there any scientific tests (like the IQ test for example ) to identify ‘tunnel vision’, inability to separate thought & feeling & other such exclusive qualities apparently caused by the simian ? Is there any statistical empirical data? (2) Please forgive my question if it offends anyone, but I suspect that this is an anecdotal myth that is repeated by everyone without questioning what it really means. I suspect that far too many people parrot these lines on their websites & books without objective evidence. I also suspect that many palm readers have been using subjective criteria to validate what they’ve read about this line. Please note that I am NOT questioning its correlation with the Down’s syndrome or other such maladies. I am questioning results attributed to normal people with Simian. Thank you for your interesting post... and tempting questions! I notice your intelligence: sharp comments & observations... resulting in fundamental questions. I very much welcome you to continue sharing your thoughts! (1) As a matter of fact, I think there is not much (scientific) evidence at all for most of the simian line theories described in books and websites; because in the field of hand reading nearly all evidence can be described as 'anecdotal evidence'. Though I think I should correct you (I hope you alllow me? ) regarding one small aspect: because most of these theories do not explicit claim that the simian line is featured with qualities that are never seen in people who do not have the simian line. (2) Yes, I fully understand what you are saying - there is quite a lot of parrot talk in the field (e.g. there is also plagiarism). And sometimes it is even hard to imagine what a description really means, and the use of subjective criteria is also applicable. But I do think that these issues are applicable to many topics in the field of hand reading that are featured with descriptions that relate to personality/psychology related features. So I don't that these fundamental problems are limited to what is written about the simian line. Good questions! They didn't offend me either. As Martijn already said, I don't know of scientific evidence that proves much about palmistry interpretations of lines - any lines, not just Simian. Many of the qualities attributed to the Simian can be found in people without a Simian. Yes, of course. Nobody said these attributes are exclusive to people with Simian lines. I suspect that this is an anecdotal myth that is repeated by everyone without questioning what it really means. I suspect that far too many people parrot these lines on their websites & books without objective evidence. I also suspect that many palm readers have been using subjective criteria to validate what they’ve read about this line. Yes I understand what you are saying, your concerns applies to all aspects of palmistry. I try to question all palmistry interpretations and modify my understanding over the years. As I don't have a simian line, I have to learn from people who do have one as to how they think it plays out in their lives. I give examples in the extract from my website as how it might manifest in different ways. Remember "every aspect of the hand has to be looked at in conjunction with all other hand features." What does this statement made by ‘Kenneth Lagerstrom’ mean ‘…since there is now no distinction between the thoughts, desires, and life itself...? We'd have to ask Ken, but I am guessing he is saying the same thing that I said about "They may find it hard to distinguish between (their own) thoughts and feelings". I guess he means 'life itself' being the objective reality. Because the two lines are joined there is only their own single perspective?? I know 2 people who have these lines joined, they are perfectly normal. I’ve known them for almost a decade. If I were to tell them this, they would give me a blank stare & think I'm crazy. They are great guys, happily married, with kids, normal jobs. Having a Simian line does not prevent anyone from being perfectly normal, a great guy, married with kids & a normal job! Maybe their wives can tell you how they think the Simian line plays out in their husband's lives, where their intensity manifests (if at all). Repeditately it has been found right in my experiences that persons with a complete simian line have tremendous tenacity or intensity of purpose, character, have great focus and concentration but it is for good or evil, will depend on other hand features; so hand must be analyzed in totality as no sign or marker is absolute in itself and everything affects everything. In any condition, self-contentedness will be the psychopath. Direction comes from elsewhere. The Simian Line is not a notorious hand crease. Thumb individualizes a person. Now, soul psychology is deciphered from fingerprints. You need here completeness and perfection and great experiences to reach at a conclusion. By the way, there are many types of simian lines and that there are other eight different approaches too to analyze a hand, besides lines on the palms of the hands! If there are unfavorable or bad signs in the hand of brutality say like it has the Mount of Venus very large, full, and red, nails short, and Mounts of Mars large, short deformed thumb, lack of longitudinal line, he can be inclined to be a criminal who may even commit murder to satisfy his desires. If such a hand is found than you can say that the person is a ‘beast in our midst’. This is a bad type indeed. A person with a simian line may be intelligent, up to the point of genius, or he may be unintelligent, down to mental deficiency. The person with Simian Line could sometime act like a genius or an idiot. With a good directional transverse he can lead a proper normal life. Why he cannot? I repeat hand must be analyzed in totality as no sign or marker is absolute in itself and everything affects everything. Enjoy! A big thank you to Mr. Martijn, Ms Lynn & Mr. Parender for giving me your valuable feedback. Yes I do understand that the Simian qualities are not exclusive to the Simian. I also recognize that the hand needs to be examined in its entirety. I'm sure that my complete lack of experience is playing a huge part in my question. However, my point was a little different. It obviously wasn't conveyed correctly in my question. So let me conceptualize the precise issue in my own mind first. I will then post a modified query. Until then, thanks for your inputs. Hearing from experienced readers is always a huge benefit. Dear learner, thank you for your well thought posts so far. And I am looking forward to see your follow-up post! In general I think the meaning of a simian line can only have specific value when it is putten in the perspective of other hand features, such as dermatoglyphics & hand shape. Our studies of skin creases in the early developing hand and in a variety of malformed hands show that these creases, which develop between 7 and 14 weeks of fetal life, are secondard to the early flexion planes in the developing hand. 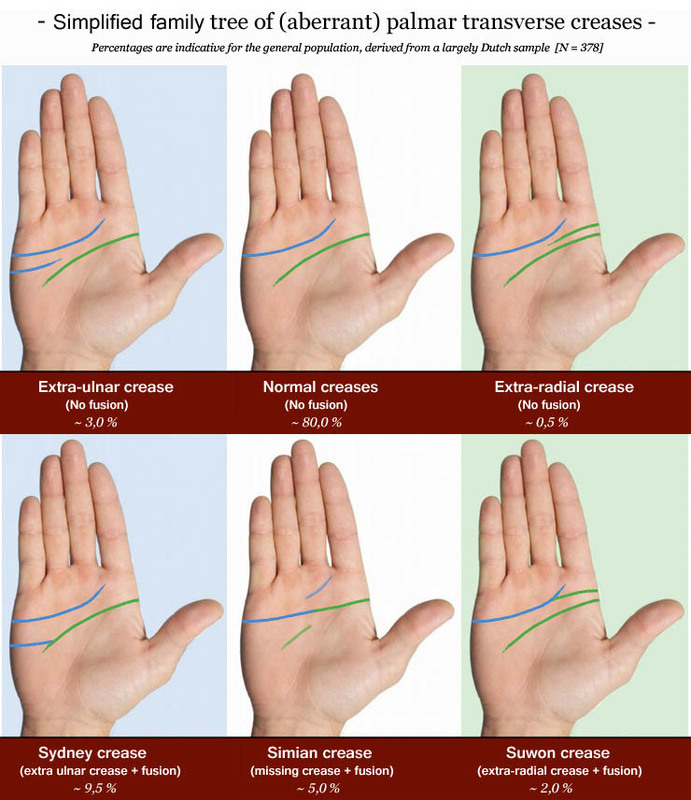 Thus with lack of development or flexion of a digital joint no underlying digital crease was found of a digital joint no underlying digital crease was found; and with lack of formations or oppositional function of the thumb there was no thenar palmar crease. The normal distal palmar sloping crease was found to be related to the sloping flexional plane of the 3rd, 4th, and 5th metacarpal-phalangeal joints and the usual mid-palmar crease represents the plane of skin folding between the sloping distal crease and the thenar crease. 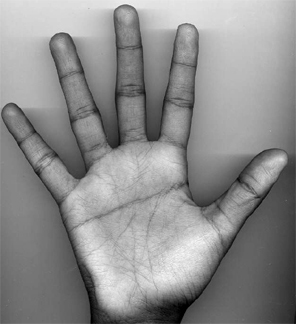 The occurrence of a single horizontal palmar crease, the simian crease, was found by roentogenographic studies to be related to a diminished slope of the 3rd, 4th, and 5th metacarpal-phalangeal joints such that only a single early horizontal plane of flexion existed in the skin of the upper palm. Thus hand creases provide a record of the early flexional planes of function in the developing hand and any crease abnormality should always be interpreted as an indication of a more primary defeat in form and/ or function of the early developing hand." learner wrote: A big thank you to Mr. Martijn, Ms Lynn & Mr. Parender for giving me your valuable feedback. During the past days I have noticed that inside the Facebook group 'The Simian Line' some people (including the admins) have adopted the believe that only simian line people are able to understand the nature of the simian line properly. I recognize this to represent another type of misperception, because in the perspective of how science works this is not quite realistic (and it could lead to simian line people putting their heads in the ground in order to ignore all related research). I also found it striking to notice that inside that group some simian line people have adopted the believe that they have a problem with separating thoughts from emotions - which I recognize to represent another doubtful idea that finds it's origins in palmistry - because some schools in psychology that thought and emotion represent sort of two sides of one experience and it is also known that most people have some trouble to separate both from each other. So the major hypothesis cherished there is not unique for simian line people neither... because it actually could apply to many people (if not most). I was wondering whether this is somehow helpful for you to know? I am also looking forward to see you posting a 'modified query' as you have planned. PS. The recent discussion inside that group have made me also aware that there is a sensible pattern inside the results that I found for how the simian line correlates with the Big Five dimensions - because the troublesome nature of the simian probably explains why my results indicate that is correlates with high scores on the domain Neuroticism (which can itself easily be recognized to have an emotional troublesome association), plus it correlates with low scores on the Big Five domain Extraversion (here it is interesting to be aware that high scores on this domain are generally perceived in American society to be favourable compared to the introversion associated with low scores). it's fundamental significance + how it became recognized as a 'minor physical anomaly'! Thank you for the latest posts. I had forgotten this topic. But now I will think about it and ask new question. Now I also have more experience, so my question will include this experience. Nice to hear this learner, I am looking forward to see your experience expressed in your new question! NOTICE: I am not aware of any other likewise relatively common hand signs that have a likewise strong effect. PS. In order to find the statistics involved you'll have to browse the individual articles involved with the themes listed at the page above. For every line there is a natural position on the palm and anything that is beyond that is abnormal. The balance is missing so to say. The Simian crease is one such case. There is powerful intensity of action as the heart and head become one as it were in the works of the subjects interest , probably the ability to detach at will is missing. It appears best if we have two separate head and heart lines. Psychodynamic profiles are now available for the simian line + 7 sub-group variations. The most consistent results point in the direction of a tendency towards low self-perceived cognitive efficiency & high scores for Neuroticism - see picture above. Psychodynamic profiles for Simian Line variations show tendency towards a low 'General Factor of Personality'!